Charming 2 BR / 1.5BA updated 4 season cottage directly on Lake Rescue in Ludlow VT. 2.5 miles to Jackson Gore and 7 minutes to Okemo Mountain. 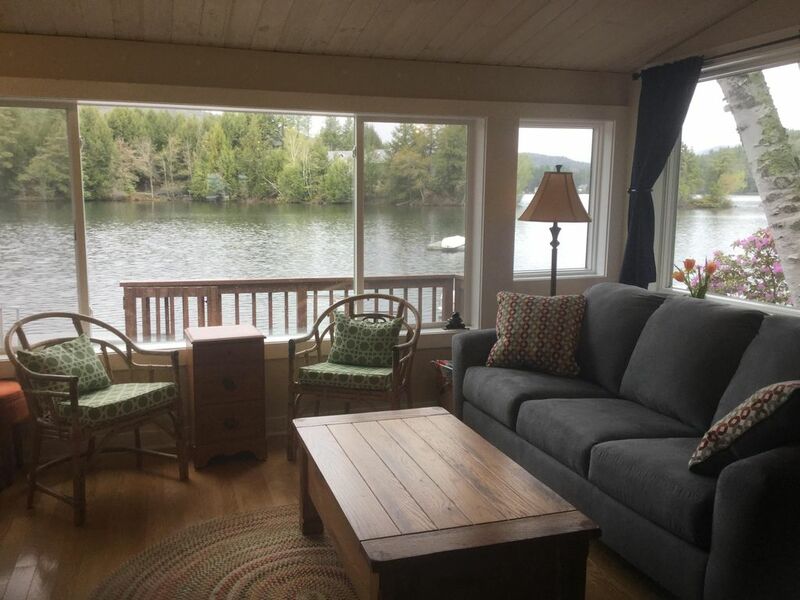 Our cottage features an open floor plan from the kitchen leading into the dining / living room that has a full wall of windows looking out directly on the lake and mountain views. There is a bath and 1/2. The main bathroom is updated and has a jacuzzi tub. The 1/2 bath doubles as the laundry room. Two bedrooms are upstairs. Both bedrooms have new mattresses. There is a queen bed in the master and a twin and a queen in the second bedroom. Bed and bath linens are available upon request. The house is fully equipped with a washer/dryer and a well-supplied kitchen including spices, slow cooker, coffee maker (full pot or single Kcups), a microwave and dishwasher. The dining room seats 6. The living room has a TV with HD cable, Apple TV for streaming and a collection of DVDs and a DVD player. There are a variety of games for the whole family. Outside, you will find a deck that sits over Lake Rescue. May-Oct there is a dock with swim ladder, a grill, 2 kayaks for recreational use (PFD provided) and a pedal boat. There is also outdoor table and chairs for lakeside dining. We enjoy every season on Lake Rescue and Okemo. Because we use this home often, you will find that it has everything you need for your lakeside vacation. We have updated the property each year. We are thrilled to open our home to those that enjoy the Okemo Valley area. Bathrooms have been updated. Main bathroom has a jacuzzi tub. Both bathrooms are located on the main floor. Lake Rescue is located in south central Vermont. Occupying 180 acres and reaching depths of 95 feet, it is the tenth-deepest and 23rd-largest lake in VT. Loons and Bald Eagles. 31 feet of water front. The dock is directly over the lake. We are in the heart of the Okemo Valley. Okemo and Jackson Gore are within a 5 minute drive. Upon request. $25 cleaning fee. There is a portable dishwasher. Instructions for use (with pictures) are located in a binder upon your arrival. May-Oct: 2 kayaks and a 5-person pedal boat are available for use. PFD are available in a variety of sizes. Thank you for sharing your lovely cottage with us and refunding the security deposit so quickly. We loved our stay even if the weather was fickle and didnt allow for much water activities. The cottage is cosy, warm and very well equipped and handly to lots of lovely restaurants and walks. Highly Recommended. Cozy and Adorable "Home away from Home"
If you're looking for a relaxing vacation, this is where you want to be. The kitchen is fully furnished with anything you need to make your own delightful dinners. From the moment you open the door, you feel right at home. Cozy and comfortable and "what a view"!! You actually feel a part of the nature that surrounds you on this most beautiful lake. My 15 year old son swam a mile in the lake, he just couldn't get enough and my 13 year old son became the all American fisherman - 14 fish in one day!! I found that kayakes weren't just for the kids, my husband and I found we could actually catch some much needed quiet time together in the middle of the lake - go figure... The cottage was clean and provided all that we needed. Can't wait to go back!! Sandi and Gordie, the owners, have made this a perfect getaway. A home away from home - just love it!! We absolutely loved our stay here, right on the shores of beautiful Lake Rescue. This is the perfect spot for a small family to get away and enjoy this tranquil corner of Vermont. We spent most of our time on the deck, where we swam and boated during the day and enjoyed the sunsets and cool breezes in the evening. The kitchen is stocked with all of the essentials and some great restaurants are nearby, too. We especially enjoyed stemwinder and the rustic rooster. Sandi, the owner, is also a joy to work with. She was very responsive when I had questions and the cottage is immaculately clean. We’re looking forward to returning in the future. We absolutely adore this lovely, well-appointed, sweeeeeeeeet cabin. We stock the kitchen with organic foods, gaze at the lake, and soak in the lake views. Truly special & gracious! There is no place we would rather stay them your beautiful home!!! We can't wait to stay again!!! Great little spot! House is well equipped and a view to die for. We stayed here for Xmas week and loved it! Great location close to ski hill and town, beautiful view out the back window, nicely furnished, and well equipped. The owners were easy to communicate with and genuinely care about the house. It shows! There is keyless entry to the cottage. Check-in is 4pm. Check out is 11am. Driveway is a flat parking area that is suitable for up to 2 cars. Parking is not permitted on the road. There is a public boat ramp to launch boats if needed. Cell phone reception inside our cottage is unpredictable at times. High speed wireless internet is provided. Bath and bedding are available upon request for a $25 cleaning fee. We supply all hand soap, dishwasher detergent, laundry detergent, toilet paper and arrange the cleaning of the entire house after each guest's stay. This is a non-smoking unit. No smoking is permitted in the cottage. The cottage is less than 3 miles to Okemo Mountain, and less then 20 miles to Killington. In the summer, aside from Lake Rescue, there are numerous hiking trails, the Okemo Valley Golf Course & Tater Hill Golf Club (and others), cheese factories and breweries (Long Trail & Harpoon). Other area attractions like Buttermilk Falls, Quechee Gorge, and Kingsley Grist Mill in East Clarendon. I am available by phone, text or email. If I do not respond right away, I have a local caretaker that can handle any question or unexpected issues. Our lake community is very quiet. We are looking for other families to share our cottage and who are respectful of neighbors. This is not a party house, but a nice family vacation spot. We request that you treat our home as if it was your own and hope that you have a pleasant stay!